Worldwide, women continue to contribute to social, economic, cultural and political achievements. International Women’s Day (IWD) is celebrated on March 8 every year as a focal point in the movement for women’s rights. The UN theme for International Women’s Day 2019 is ‘Think equal, build smart, innovate for change’. The focus of the theme is on innovative ways in which to advance gender equality and the empowerment of women, particularly in the areas of social protection systems, access to public services and sustainable infrastructure. 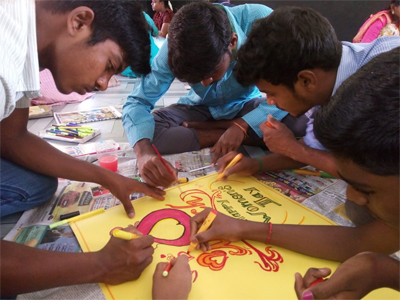 To commemorate the event, SARVAM women leaders and volunteers were invited on March 9, 2019, for a celebration and sharing event. More than 100 women participated. A rousing motivational talk was delivered to emphasize that each woman can be a leader within her own sphere of influence and commit to take practical steps to accelerate gender equality. Thereafter a few women were invited to share their experiences and challenges and how each one of them overcame them. A recent incident which was narrated and received with a lot of interest was from a volunteer who made a solo trip to Oman. She narrated how she was to travel with a few acquaintances to the Middle Eastern country to visit her husband who works there. At the last minute, the fellow travellers cancelled their trip due to some urgent reason and here she was in a very difficult situation – she would either have to travel alone or forfeit the exorbitant airline ticket amount. Despite many dire warnings, she decided to travel alone. She is semi-literate so she found the entire trip – from checking in at the airport to boarding the flight and then finding herself seated between two strange men – very overwhelming, but she maintained her calm and courage and reached Oman safe and without any mishap. The entire experience gave her so much courage that she even navigated her way around in Oman when her husband was at work. Her grit was appreciated and applauded by all the participants. It was a day of joyful exchange for all the women and ended with a sumptuous lunch for all. 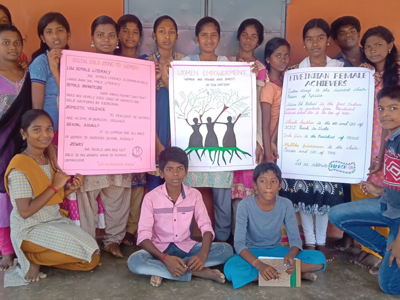 Since 2013, SARVAM in association with US Consulate, Regional English Language Office (RELO) and FHI 360 has been running the English Access Microscholarship Programme through which the students in the village learn English language through varied activities and mediums. As an enhancement activity, the commemoration of the Women’s Day was conducted in the Access classes on March 10, 2019. 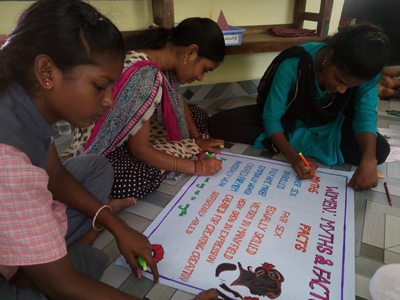 All the Access students actively participated and made poster with slogans, wishes and poems on the greatness on women. The students also spoke about various achievements of the women in the world and the role women played in their personal lives. Before any such programmes are organized the Access trainers take the opportunity to explain to the students the purpose and the aim of such international days, which gives the students a chance to learn more not only in terms of English but also general knowledge. The enthusiasm and joy of the students made the day very special. View all editorial team posts.